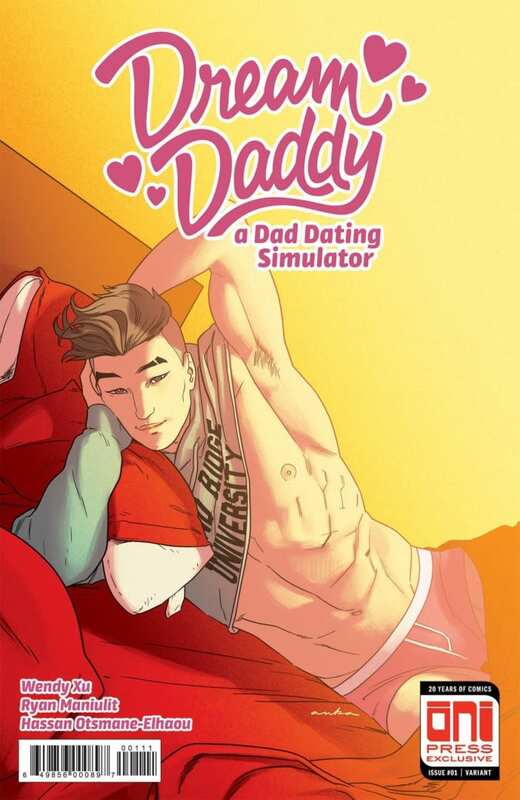 Oni Press released the first issue of the comic series based off the hit queer dad dating simulator, Dream Daddy: A Daddy Dating Simulator. The comic series will have a limited five-issue run. The series came as a surprise (and delight) to many fans, who since finishing the game, have craved a continuation of the story in some way. …I had foretold the future. The first issue, “Much Abird About Nothing,” focuses on Craig, the player’s friend from university, and the protagonist’s visit to a 15-year college reunion. The story explores existential crises, parenting, and of course, romance. Also thieving seagulls, as pictured below. You can check out the first issue of the Dream Daddy comic series on Comixology, Amazon, Steam, and other retailers. Issues two through five will be available only in a digital format, but fans can grab the limited print edition of the first issue by visiting the OniPress website. You can choose from one of two variant covers, although it might be obvious which one you would want to choose… Just saying. By the way, if you buy the print edition, you get a centerfold of that above image. Excuse me while I wipe the drool from my face. The second issue, which will release Sept. 26, will focus on Goth Daddy Damien when he first moves into the neighborhood, and how Robert, aka Tough Daddy, thinks he’s a vampire. For more information on the series and release dates of future issues, visit the Steam web page.